Neti Pot, Salitair Inhaler Kit, SinuCleanse, Nasaline Irrigator! Neti Pot™: The nasal passages are lined with a thin layer of mucus that is one of our body's first lines of defense against disease. A nasal wash keeps this layer of mucus moist, clean, and healthy. Using the Neti Pot helps: Remove excess mucus due to congestion and soothe dry nasal passages. Rid nostrils of pollen and other allergens. 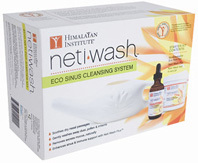 Cleanse the nasal membranes of dust, smoke, or other airborne contaminants. Relieve nasal dryness due to air travel. Improve flow of breath before doing relaxation or meditation techniques. Caution: Remember a nasal wash is not a substitute for medical treatment. Anyone with chronic inflammation of the nasal passages or other ear, nose, or throat disorders should seek medical attention.ORDER NOW! • Neti Pot Original Cerami: Original Ceramic Neti Pot™ dispenses the perfect rate of flow to optimally cleanse the sinus passages. Made with lead-free ceramic and food-grade glaze. The Ceramic Neti Pot is not microwavable. Dishwasher-safe. ORDER NOW! • Neti Pot Eco Travel: Nonbreakable pot is perfect for travel. Made of biodegradable plastic. The Eco Travel Neti Pot is not microwavable. Dishwasher-safe. ORDER NOW! • Neti Pot Original Ceramic Starter Kit: Includes Original Ceramic Neti Pot™, Neti Salt™, 10 oz., Neti Wash Plus Daily Boost, 2 oz. (to help sooth dry nasal passages), and Neti Stik Inhaler (cooling and energizing sensation for the nose) FREE BONUS. Made with lead-free ceramic and food-grade glaze. The Ceramic Neti Pot is not microwavable. Dishwasher-safe. 3 pc. ORDER NOW! • Neti Pot Eco Travel Starter Kit: Includes Eco Travel Neti Pot™, Neti Salt™, 10 oz., Neti Wash Plus Daily Boost, 2 oz. 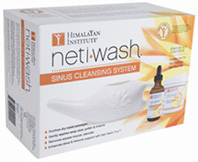 (to help sooth dry nasal passages), and Neti Stik Inhaler (cooling and energizing sensation for the nose) FREE BONUS. Nonbreakable pot is perfect for travel. Made of biodegradable plastic. The Eco Travel Neti Pot is not microwavable. Dishwasher-safe. ORDER NOW! • Neti Pot Salt: Neti Salt™ is the purest available, so that impurities in the salt do not irritate your gentle nasal passages. 99.99% pure non-iodized salt. No additives or anti-caking agents. Pharmaceutical grade. The Neti Salt jar and measuring spoon are biodegradable! 12 oz. ORDER NOW! Ingredients: Pharmaceutical grade sodium chloride (99.99%). HEALTH RELATED/NASAL RINSING: Neti Pot Salt, 12 oz. • SinuCleanse® Neti Pot System: A gentle, effective nasal wash for adults and children who suffer from sinus and nasal problems. Developed by a leading Ear, Nose and Throat physician, it helps to relieve symptoms caused by sinus infections, allergies and the common cold including: congestion, irritated nasal passages, nasal drainage, post-nasal drip, cough, and sinus headache. Simply dissolve the natural saline solution ingredients in the SinuCleanse® pot and gently wash your nasal passages. Soothe and moisten your sinuses, improve your breathing, and feel better naturally, without drugs and without side effects. [Includes Sinucleanse Pot 1, Saline solution 10 packets, and Nasal Adapter 1]. ORDER TODAY! • SinuCleanse Squeeze Nasal Wash Kit: All-natural nasal wash System for relief of: Nasal Congestion, Sinusitis, Allergies, Dry Air Post-Nasal Drip, Rhinitis of Pregnancy, Instant Relief from Allergies and Sinus Symptoms. Nothing is more soothing to the sinuses. The SinuCleanse system has been clinically proven to provide the most effective relief, giving you an alternative to pills and sprays and their side effects. It can also enhance the effectiveness of your prescription sinus remedies and is the safest and easiest way to feel better instantly. Exclusive bottle design. Doctor developed and recommended. [Includes SinuCleanse Squeeze bottle, 1, Saline solution 30 packets, and Instructions]. Warnings: Stop use and ask a doctor if washing is uncomfortable or symptoms are not relieved. ORDER TODAY! • SinuCleanse Saline Refill: Gentle and effective. Saline irrigation may help relieve symptoms including nasal congestion, dry irritated nasal passages, thick nasal drainage, post nasal drip, cough and sinus headache. 60 packets. ORDER TODAY! • Nasal Cleansing Pot: Ancient Secrets Nasal Cleansing Pot is the ideal answer for removing dirt, pollen, excess mucus, and other irritants and soothing and moistening to dried out nasal passages.You need only follow the simple directions inside to prepare the saline solution used to rinse through your nostrils helps improve your overall feeling of well-being. With nasal passages blocked as a result of the effects of pollution, dust, pollen and other irritants, you may find this simple cleansing and moisturizing technique of invaluable benefit to you. Heavy duty Construction and Dishwasher Safe. Caution: If you are suffering from any disease or illness, be sure to consult your health care practitioner before using Nasal Cleansing Pot. • Nasal Cleansing Pot / Original Ceramic: Crafted from sturdy lead-free ceramic and coated with food-grade sealant glaze. Advanced design with easy-grip handle, better nozzle seal, balanced for ease of use, concave grip for more assured control, better water chamber for less mess and easier cleaning. ORDER NOW! • Nasal Cleansing Pot / Plastic Travel: Crafted from sturdy food-grade HDPE lead-free plastic. Advanced design with easy-grip handle, better nozzle seal, balanced for ease of use, concave grip for more assured control, better water chamber for less mess and easier cleaning. ORDER NOW! • Salitair™ Salt Air Inhaler Kit: Salt Air Inhalation Therapy is an easy-to-use drug-free method that eases symptoms of respiratory discomforts. A few minutes of regular daily use can: Ease breathing, benefit the respiratory system, and thin mucus and ease expectoration Used for people sufferring from asthma, bronchitis or rhinitis, Whooping-cough, hay fever, or colds. Pollen allergies or other allergies of the respiratory tract. Snoring and respiratory problems caused by smoking. Salitair™ Salt Air Inhaler gives significant improvements in forced expiratory volume. Mucus becomes thinner, and hence eases expectoration. Night suffocation and coughing is reduced or prevented completely, and easier breathing. Salitair is lightweight for travel, easy to use, easy to clean, hygienic, refillable, and practical and durable. WARNING: We recommend that you consult your physician before using this product. ORDER TODAY! "SALT CAVE THERAPY" in Your Own Home! How does it work? Rock salt crystals are placed between the filters inside a refillable inhaler. As you inhale through the mouthpiece, the moisture of the passing air absorbs microscopic salt particles which permeate through your respiratory system. The humidity in the air is sufficient to enrich the air with minute salt particles when the air passes the salt crystals. Hence a micro-climate of the curative salt caves has been created. 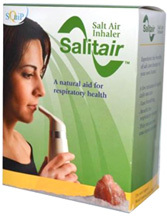 • Salitair™ Salt Air Inhaler Kit: Plastic. 2 pc. ORDER NOW! • Himalayan Salt Air Inhaler Kit: Ceramic. 2 pc. ORDER NOW! • Himalayan Salt Crystal Refill: For use with the Salitair Salt Air Inhaler and the Himalayan Salt Air Inhaler. Our salt crystals are the finest pure Himalayan salt crystals rich in minerals and trace elements. 7.75 oz. ORDER NOW! HEALTH RELATED/NASAL RINSING: Saltair Salt Air Inhaler Kit / Plastic, 2 pc. HEALTH RELATED/NASAL RINSING: Himalayan Salt Air Inhaler Kit / Ceramic, 2 pc. 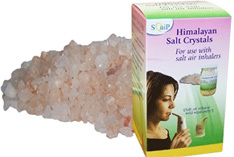 HEALTH RELATED/NASAL RINSING: Himalayan Salt Air Crystal Refill, 7.75 oz. 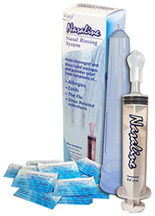 Nasaline Nasal Irrigation System:Nasaline is a unique, patented, drug-free nasal rinsing system. With the simple use of saline solution, Nasaline effectively washes away unwanted mucus, crusty secretions or allergens and provides relief from symptoms associated with allergies, colds, the flu and other sinus related infections. After a prolonged stay in dry, dusty, or smoky environments, Nasaline cleans and soothes the nasal passages, reducing nasal irritation and moistening the mucous membranes. Nasaline is also recommended for: Drug-free relief from pregnancy congestion. Follow-up treatment to sinus or nose surgery. Relief from symptoms associated with nose polyps or after the excessive use of cold medicines such as nose sprays and drops. Designed to produce a gentle and effective swirl when the saline solution enters the nose. Made of medical grade silicone without any harmful plastic manufacturing components. WARNING: We recommend that you consult your physician before using this product. 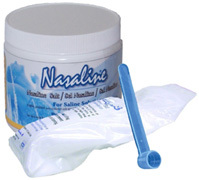 • Nasaline Nasal Rinsing System Adult: Nasaline consists of a 2 oz. syringe and a silicone tip. Simply fill the Nasaline syringe with saline solution and experience drug-free relief from everyday nasal and sinus ailments. The Nasaline product is entirely latex-free. ORDER NOW! -- Saline packets 10 ct.
• Nasaline Nasal Rinsing System Junior (under 12): Now children can experience relief with Nasaline Junior, a nasal rinsing system specifically designed for children under 12, delivering just the right dosage for smaller noses! ORDER NOW! Nasaline® Salt: Highly Purified Sodium Chloride specifically made for use in mixing saline solution. Nasaline Salt is 99.99% purified sodium chloride specifically manufactured for use in mixing saline solution. Nasaline Salt contains no additives or preservatives. We recommend using Nasaline Salt to prevent possible allergic reactions that one might develop from the iodine in store bought iodized salt or from the algae sometimes found in sea salts. • Nasal Salt: 10.5 oz. Jar (Makes approximately 120 cups of saline solution). ORDER NOW! • Nasal Salt: 50 pre­measured packets/box. 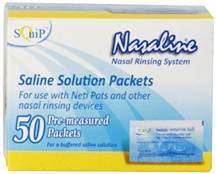 Make nasal rinsing treatments easier and more portable with handy pre­-measured saline packets. Each packet contains one-half teaspoon of Nasaline Salt, when mixed with 8 ounces of warm water makes an isotonic saline solution. 50 ct.. ORDER NOW! HEALTH RELATED/NASAL RINSING: Nasal Salt, 10.5 oz.